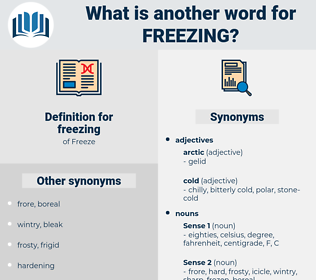 What is another word for freezing? refrigerating, icy, chilled, gel, chilly. 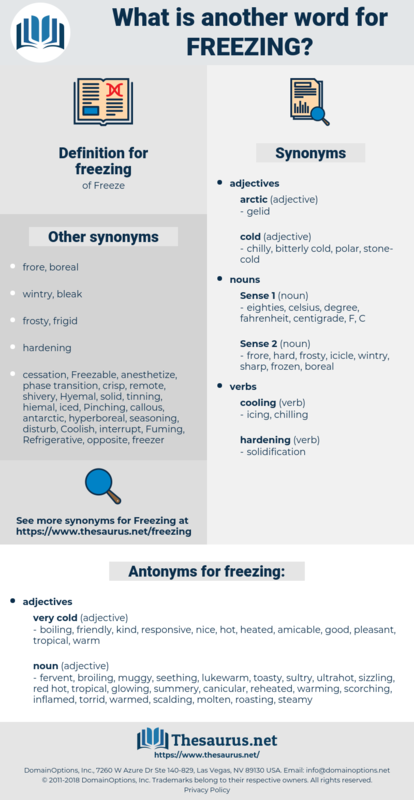 blocking, immobilization, frostbite, immobilisation, refrigerating, cooling, condensation, gating, icy, gel, locking, blockage, seizure, withholding, blockade, zero, embargo, setaside, halt, goo, immobilizer, deadlock. Suspending, seizing, Obstructing, Hiring, Capturing, Selecting, Reserving, Forming, shaking, stalling, Relating, engaging, spoiling, Committing, Allowing, speaking, Clogging, blocking, cooling, locking, withholding. suspend, frost, restrain, withhold, gel, halt. frozen, freezer, refrigeration, cold, frost, ice. good, amicable, kind, nice, hot, boiling, friendly, heated, responsive, pleasant, warm. fervent, broiling, muggy, seething, lukewarm, toasty, sultry, ultrahot, sizzling, red hot, tropical, glowing, summery, canicular, reheated, warming, scorching, inflamed, torrid, warmed, scalding, molten, roasting, steamy, white-hot, flushed, equatorial, fiery, snug, fervid, overheated, feverish, blazing, sweltering, burning, tepid, ardent, igneous. In warm weather, these eggs hatch in a few hours; if the temperature remains about freezing point, they soon die. But before he had worked the ice long, he had to stop, for his hands seemed freezing.